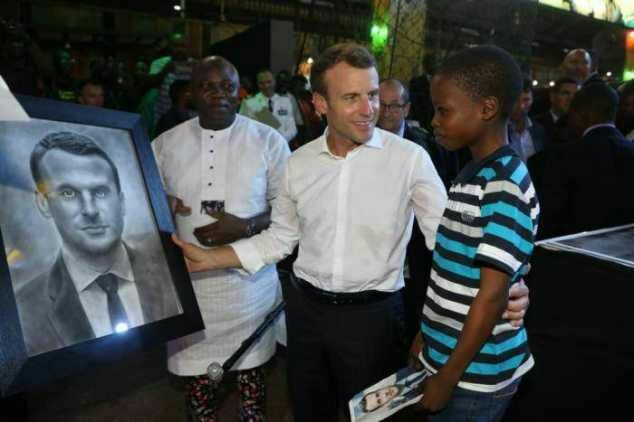 Recall the story of an 11-year-old boy, Kareem Waris Olamilekan who drew a portrait of French President, Emmanuel Macron in two hours during the President’s visit to the new Afrika Shrine, Lagos State. Yeah! Lagos State Governor, Akinwunmi Ambode has found interest in him, he has decided to support his Education. It was reported that the young boy was hosted by the Governor alongside Adewole, his instructor who has an Art Academic where he train young artist, the Governor has also promised to assist Adewole for inspiring young people. The Governor has also promise to give Waris all the assistance he needs to groom his talent in Artistry as well has his Academics.